The three Democratic senators who voted to confirm Neil Gorsuch to the Supreme Court have now all met with Judge Brett Kavanaugh in the lead-up to his confirmation hearings. The D.C. Circuit Court judge was nominated for the Supreme Court by President Donald Trump and has faced fierce opposition from the left, but Sens. Joe Donnelly (Ind.) and Heidi Heitkamp (N.D.) met with him Wednesday, USA Today reports. This comes after West Virginia Sen. Joe Manchin (D.) met with Kavanaugh back in July. All three are up for re-election in states Trump carried easily in 2016. Donnelly said he will not decide how to vote until after Kavanaugh's confirmation hearing, scheduled for Sept. 4. 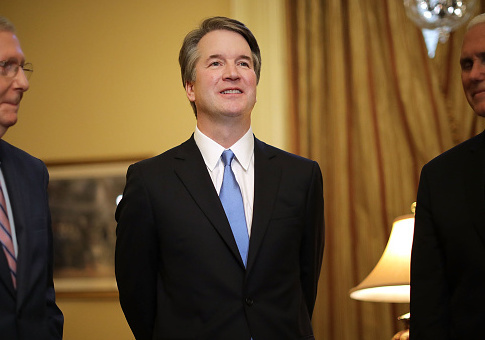 "This was an important opportunity to sit down and talk in-depth with Judge Kavanaugh about his record, experience working in the Bush Administration and serving on the federal bench, and views on the role of the Supreme Court as well as on a range of issues including precedent, health care, and judicial independence," Donnelly said. Heitkamp also made a statement about the meeting and said the hearing would be "part of a thorough and exhaustive review." "Many members of Congress and outside groups have already expressed their opinions on how I should vote before I’ve had the chance to do my job of fully considering this nominee," Heitkamp said. "As I’ve continued to say, one of the most important jobs of any U.S. senator is to fully vet any nominee to serve on the Supreme Court, the highest court in our land." While Democratic senators on the left have denounced Kavanaugh and speculated he might vote to overturn precedents such as Roe v. Wade, red-state Democrats have taken a different approach. Manchin, Donnelly, and Heitkamp all voted for Gorsuch despite passionate denunciations from prominent Democrats, such as Sen. Elizabeth Warren (Mass.). So far, Democrats opposing Kavanaugh have made growing demands for documents but have not settled on a particular line of attack on Kavanaugh's qualifications. White House spokesperson for Kavanaugh’s nomination Kerri Kupec said Kavanaugh is hard at work preparing for his hearing. "Judge Kavanaugh is engaged in extensive preparation for his upcoming hearing," she said. "He continues to meet with senators and is spending many hours preparing for potential committee member questions and participating in mock hearings." This entry was posted in Issues and tagged Brett Kavanaugh, Heidi Heitkamp, Joe Donnelly. Bookmark the permalink.